Penn Manor welcomed 20 new teachers for the 2017-2018 school year during New Teacher Orientation Day, held Tuesday, Aug. 8, at Manor Middle School. Aliza Becker, grade 6; Cristen Appel, grade 1; Paige Martin, learning support; Anna Raneiri, learning support; Emily Tracy, speech and language impaired. Kailey Brennan, music; Morgan Fasnacht, art. Megan Binkley, kindergarten; Ashley Brubaker, music; Brandon Leinbach, grade 1; Morgan Stepanchick, learning support; Kathleen Myers, grade 1. Vicki Fafel, grade 6; Jeb Thompson, grade 2. Caroline Lovett, grade 4; Grace Painter, grade 2; Danielle Zook, learning support/life skills, grades 1-3. Julie Knauss, English; Katherine Ream, math; Leomery Silva-Tavarez, Spanish; Kayla Starry, social studies; Christopher Vrabel, biology; Mary Wittemann, biology; Thomas Bechtel, social studies; Joel Ernst, science; Beth Reburn, learning support/English; Mitchell King, math. To all new staff members, welcome to the Penn Manor family, and best wishes for the 2017-2018 school year! New Penn Manor teachers include, (front row, from left) Megan Binkley, Katie Ream, Mary Wittemann, Kailey Brennan, Grace Painter, Kayla Starry, Paige Martin, Morgan Stepanchick, Cristen Appel, Krista Eby, Leomery Silva-Tavarez (back row, from left) Brandon Leinbach, Chris Vrabel, Julie Knauss, Danielle Zook, Anna Raneiri, Morgan Fasnacht, Aliza Becker, Caroline Lovett and Ashley Brubaker. 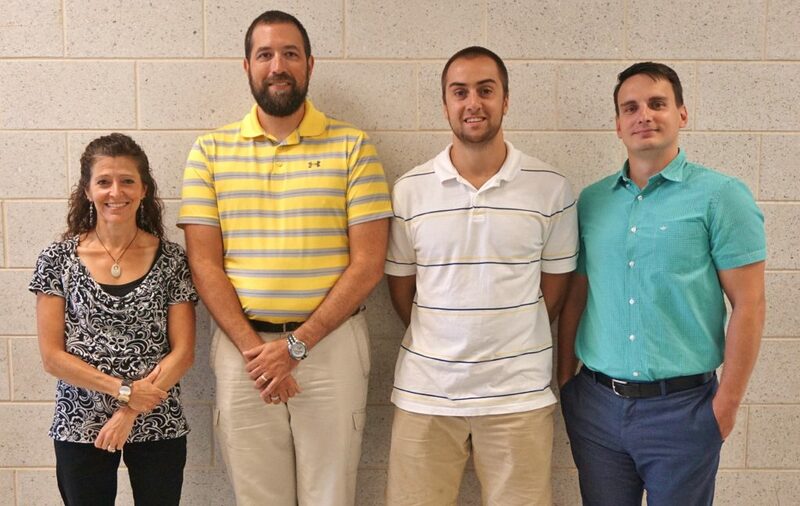 From left, new teachers Vicki Fafel, Joel Ernst, Mitch King and Jeb Thompson.